"Rapid snowmelt accompanied by heavy rainfall led to extreme flooding in portions of eastern Nebraska and western Iowa earlier this month, with river levels exceeding all-time records in several areas." said Kyle Tapley, Senior Agricultural Meteorologist for Maxar. 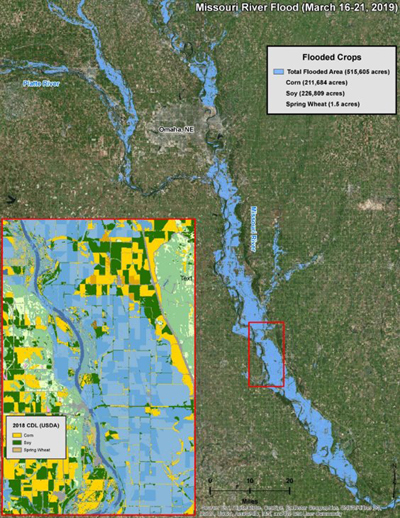 "We estimate that more than 400,000 acres that produced corn and soybeans last year were inundated during this flooding event." said Jorge Cardona, Senior Imagery Analyst for Maxar. "Major flooding is inevitable in the coming weeks as a deep snowpack continues to melt across the Red River Valley, an important corn, soybean, and spring wheat growing area." said Mr. Tapley. Maxar's WeatherDesk provides access to timely and accurate weather data that empowers decision making and mitigates risk. Special weather reports focus on key market-moving concerns and 24/7/365 consultation is available for clients worldwide. The operations of DigitalGlobe, SSL and Radiant Solutions were unified under the Maxar brand in February; MDA continues to operate as an independent business unit within the Maxar organization.